This is a really elegant & striking Deco robe. 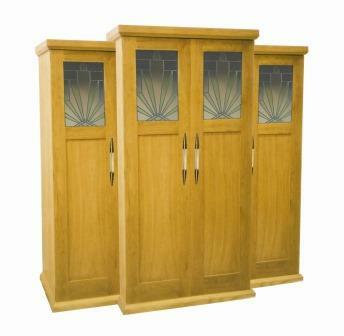 The use of Oak & simple shape & panelled doors recalls the Utility furniture of the 1940's. 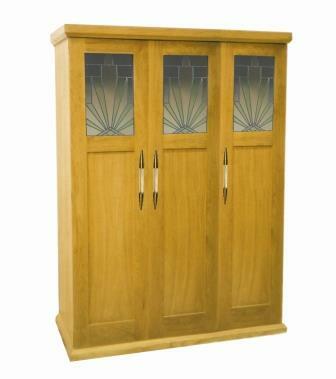 The use of glass panels & the handles really lifts the whole piece to something special. The stained glass panel's design combines a stepped 'Skyscraper' profile with a 'Rising Sun' motif into a sucessful new design. 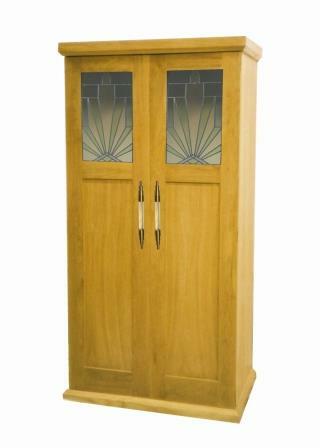 The 'Skyscraper' handles add a real wow to the piece, & echo the stepped glass panel shapes. 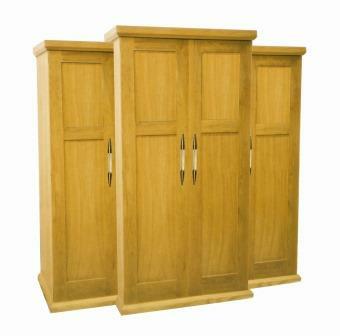 These handles are quite expensive but really make the wardrobe. 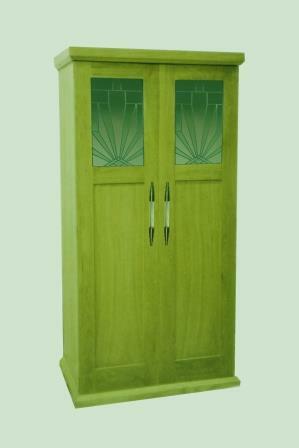 You could for something subtler, such as a bar handle or matching wood handle. 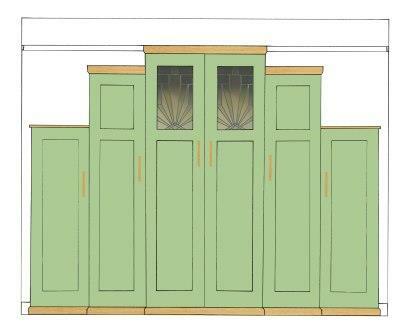 Below are shown versions showing different finishes & colours. Also shown are different design variations. 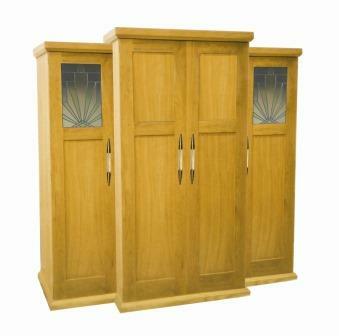 3 different finishes for the same robe; mahogany, brown oak & medium oak. 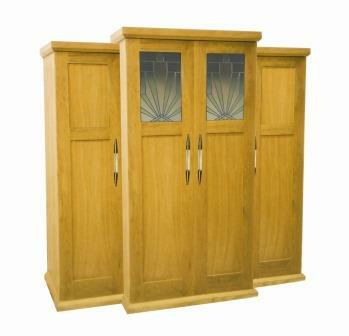 The above 4 door wardrobe is a stunning piece of Deco furniture, whichever version you prefer. You can see a straight 4 door robe above, but as soon as you introduce the stepped profile & breakfront it becomes a gorgeous modern Deco piece of furniture. 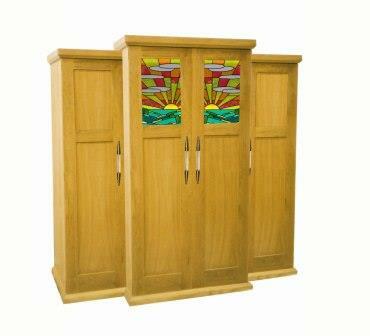 We've shown all the options between solid & stained glass panels. While this would be an expensive piece of furniture what an impact it would make in a room. The interior can be fitted out any way you like. Made to order. 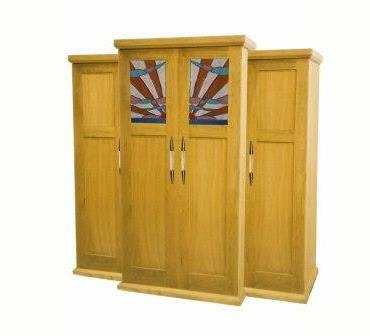 You can play around with the design, size, colours etc as much as you want. The above 6 door 'Skyscraper' style stepped & breakfront robe is shown on another wardrobes page, but shown to give you some ideas of the endless variations possible. It's always a sign of a sucessful design, & attention to the details, when the wardrobe handles not only suit the style of wardrobe but actually add to the whole look. The handle shown above does just that. The stepped 'Skyscraper' handle looks fantastic, but is expensive. You could equally have used a steel bar or matching wood handle. Ht 30cm / 12". 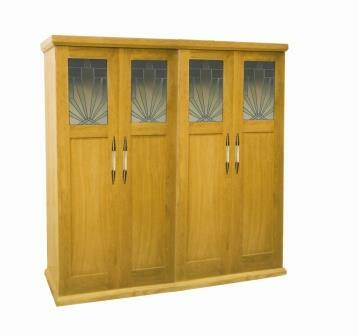 Even many of the handles we show are made bespoke, so you can specify the size, finish, quantity, etc. This makes them more expensive than off the shelf handles, but you get something more unique & design led.